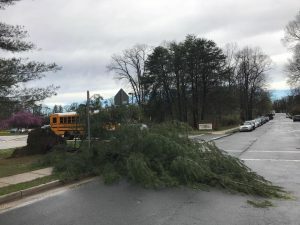 The National Weather Service has confirmed that a small tornado touched down in Herndon during Thursday afternoon’s storm. SIX TO 10 TREES DOWN IN VICINITY OF BUILDERS ROAD AND CRESTVIEW DRIVE … ALL FALLING TOWARDS THE NORTH. WOOD FENCING ALONG CRESTVIEW DR BLOWN TO THE WEST. The tornado was classified as an EF-0, the lowest level on the scale, with a top wind speed between 60 and 70 mph. Preliminary damage survey results show it was on the ground for about three-quarters of a mile, with a maximum width of 25 yards. A second EF-0 tornado in the area touched down in southeast Washington, D.C., about five minutes after the Herndon tornado. No one was reported injured in either location. The storm toppled numerous trees in Reston and the surrounding area Thursday. The National Weather Service says it is investigating other locations in the area today.